Advert appearing in the Argus newspaper on Saturday 7th May 1892 referring to the team as "The Magpies". The club emblem is based on the Australian Magpie bird, however it is unclear where the use of the Magpie originated from. When the South Australian inter-colonial team played against Victoria in 1891 their emblem was a 'piping shrike' which is a white backed Magpie. Given the colours and design of the South Australian team were used to represent Collingwood Football Club it is possible that the logo of the Magpie was also adopted from them (Lyon, Shiell, and McDonald, 2003). However, consideration needs to also be given to the large population of Magpies that nest at Dights Falls (Unesco world heritage site Dights Falls. n.d.), which is behind Victoria Park (or Dights Paddock). 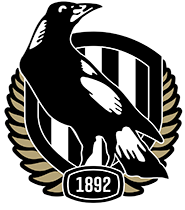 In the late 1800's, around the time of the Pies formation it was common for Magpies to be kept as pets (Warragul Guardian and Buln Buln and Narracan Shire Advocate, 1882), and with so many being in the local area it could be that it was deemed to be the natural choice for the team mascot. Ultimately, it is reasonable to presume that the case rests somewhere in the middle, that is; both the South Australian emblem, and the natural habitat of the Magpie behind Victoria Park played a role in deciding what mascot would represent the club. From the very first game the team was referred to as the Magpies and is now a strong image of the Collingwood Football Club. © 2012. alanthall. This is a fansite, and is not an authorised website of the Collingwood Football Club.